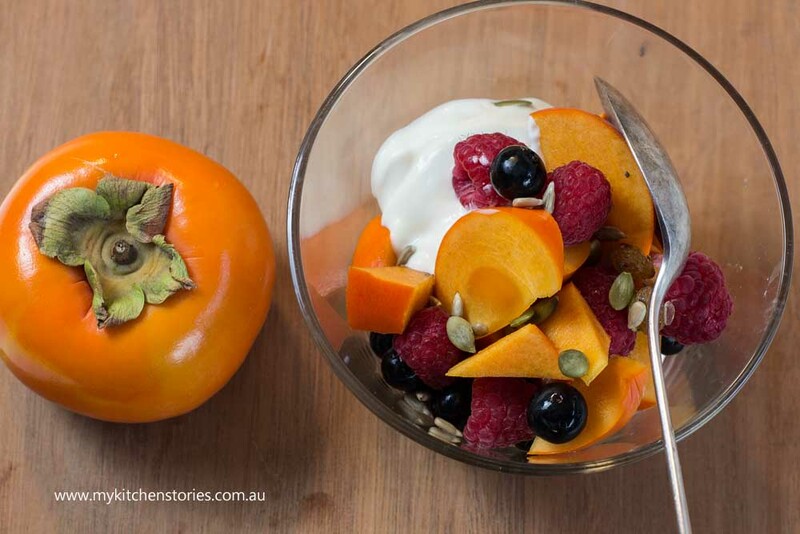 Persimmons are still a bit of an unusual fruit here in Australia. We haven’t fully cottoned onto them despite the crop in Australia and New Zealand growing rapidly . You’ve probably seen them in the supermarket between February and June and wondered what they are and how you are supposed to eat them. I am going to go out on a limb here and tell you that if you try them you are really going to be surprised. They’re crunchy and sweet and very versatile whether you eat them like and apple or use them in salads and cooking. The persimmon is a native of China, but was taken by the explorer Marco Polo for trade in the early 14th century. It spread to Korea and Japan and later to the Mediterranean coast of France, Italy and Algeria. The fruit was introduced in California and Australia in the mid-1800s. There are two types of Persimmon. I like to differentiate them by calling one of them the mushy yucky kind and the other the most sweet, crunchy lovely fruit of winter. This in fact maybe a reason Persimmons have been slow to become a real commercially viable crop here- lots of people do not like the yukky (or astringent) kind. These have given persimmons a bad name and hand braked there style. 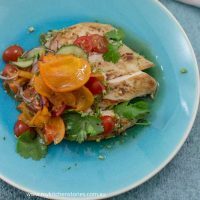 Persimmons never brown when cut so they really do make a great fruit to pop into fruit salads, onto desserts and even use with savoury ingredients like this Chicken Persimmon Salad with a Thai Dressing. To marinate the chicken put the first amount of fish sauce, oil and ginger in a bowl and combine. Add the chicken breasts and turn over in the mixture. Wash hands and let sit. To make the salad and dressing. Put the coriander, chilli, lemon juice, sugar and water, fish sauce, garlic in the food processor (or pestle and mortar) and process till fine. Pour into a medium sized bowl. Add the chopped tomatoes, Spanish onion and cucumber to the bowl. 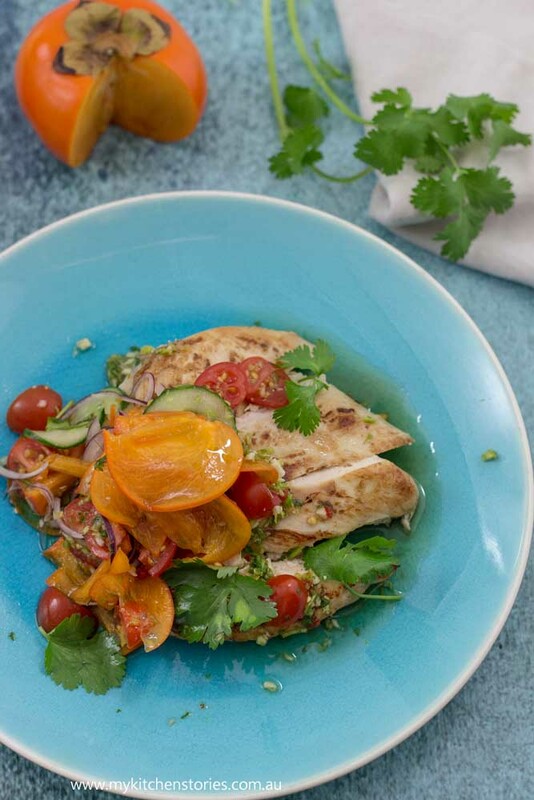 Sprinkle with peanuts and mix in extra coriander leaves and stems. Asian shops sell dry roasted unsalted peanuts that are the best for this. 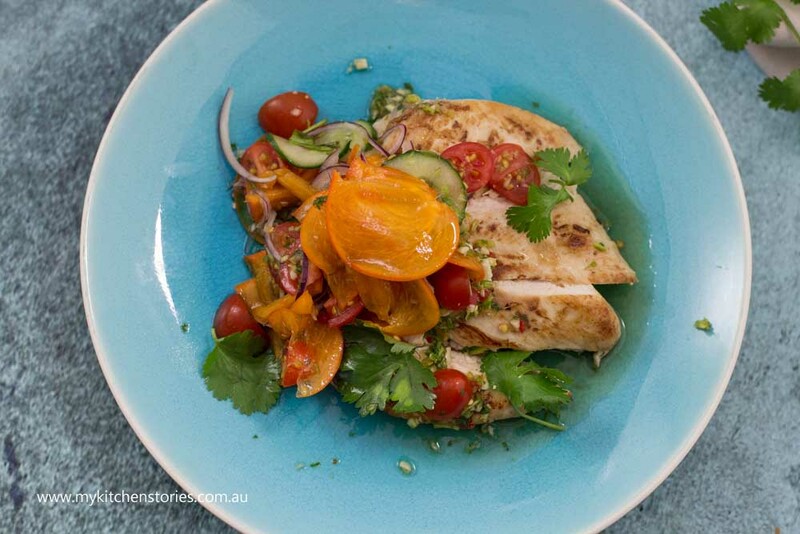 Try these great recipes too.